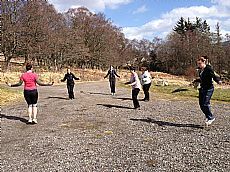 'Scottish Boot Camp' - 'Does what it says on the tin' to steal an advertising slogan for Ronseal!! The location and range of activities are fantastic and it has been a pleasure to see all that the surrounding area has to offer. The activities are well thought out, challenging and exhausting which is exactly what I wanted and needed. I have been helped to exceed my own expectations in terms of fitness with the encouragement of Matt and Jim, and the rest of the team. Thanks to Sara and Al for providing all that Scottish Boot Camp has to offer. I feel I know myself better after this week and am taking away a list of things to do, try and change. I particularly enjoyed the 4 course meal (calorie controlled of course) with our chef Ritchie, a lovely treat, thanks very much.